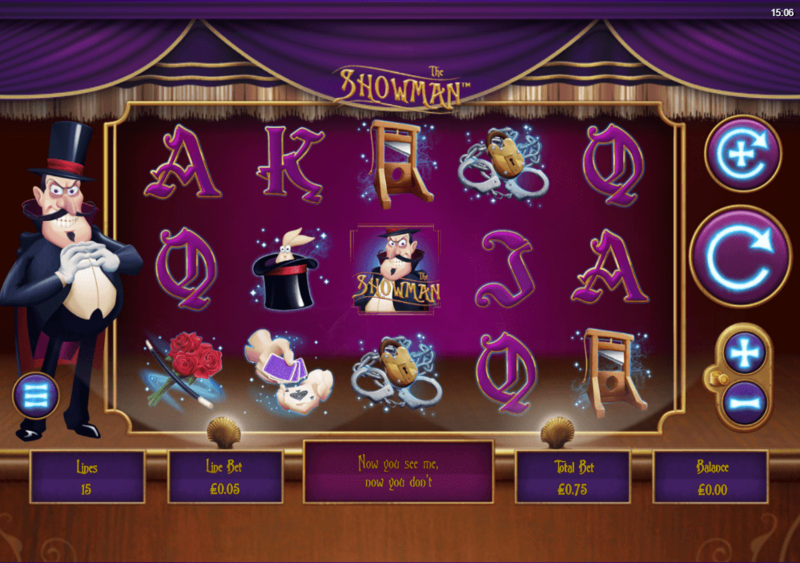 Inspired by the Hollywood film, The Greatest Showman, this online casino slots brings some show business to the reels as five of them, complete with 15 pay lines, make for a real spectacle in this title, known simply as The Showman. A musically themed slot, this game is all singing and all dancing, making for an exciting experience that is packed wilds and bonus spins. We have a wide selection of games for you to choose from, but this really steals the show! Leander Games are the developers of this ambitious, Hollywood spectacle of a slot game. They have packed the game with their own magic, bringing really high-quality animations and graphics to the reels and tailoring the symbols and features so well to the theme at hand. Leander Games have a constantly growing collection of online slot games and this is amongst their best, but for other titles from then worth checking out, see Candy Spins or Ave Caesar. Do you just love to try these UK slots games out now? The film of which this slot game takes inspiration from was a 2017 release and something of a hit in the box office. Capturing the intensity of everything behind the glamour of show business, it hit home some realities about the music industry in question. New players are encouraged to see our guide and play the best online video slots. This online slot game doesn’t so much look into the depth of the psyche of the performer, as it does simply use the aesthetic of the film to create a very well-designed and high-end feeling game. The graphics are very well developed and this is a truly modern feel thanks to the quality of animation. Purples and golds make for quite a luxurious, glamorous feel and a strong soundtrack, fitting when you consider the theme in question, ties the whole package together with a little golden ribbon on it. Playing card symbols make up the low paying symbols in The Showman, fitting when you consider the influence of magic and the presence of card tricks within the art as well. Furthermore, symbols more relevant and exclusive to the game include a guillotine, a rabbit in a hat, roses with a magic wand, 2 hands with magic cards and a lock with a chain on. 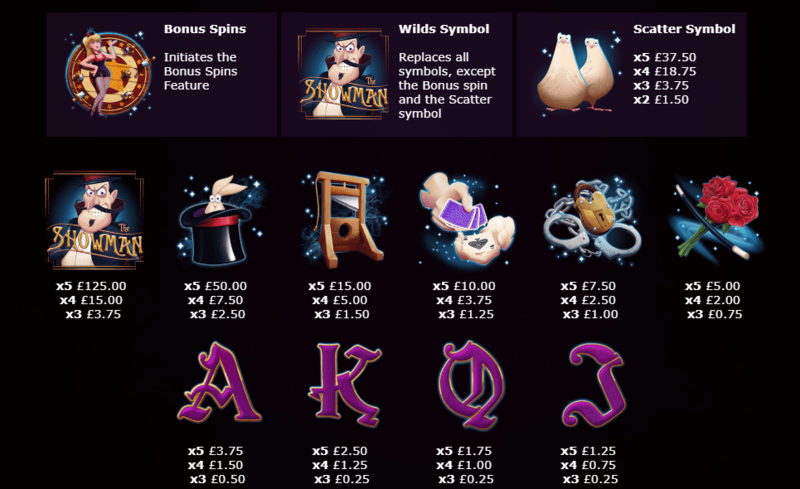 As for bonus symbols, the Magician’s assistant, Deborah, can trigger the bonus spins on offer here - so she is worth landing on the reels, for sure. Also, the scatter symbols are made up of two white doves, another integral symbol both to the bonus features and to the magic. The wild symbol is unsurprisingly represented by The Magician himself. The magic doesn’t stop here, as he can The Magician can select a certain spin and replicate the symbols involved on the other reels. This magic can really help you out with some unexpected wins. This game packs some real star quality and Leander Games have done well to pay tribute to what was a glamorous Hollywood production. Graphics here are the main attraction and the way that magic has been sprinkled into the gameplay is not only really clever but really useful, too. You never know when some magic might sort you out a win. Are you enchanted by The Showman? Discover the slot game, the Wolf On Win Street today!